. . .Blushing and brightening, she hastily wiped her eyes, and looked upon them as only a mother can. "Hoity! Toity! pretty talk we're having, and Saint Nicholas' Eve almost here! What wonder the yarn pricks my fingers! 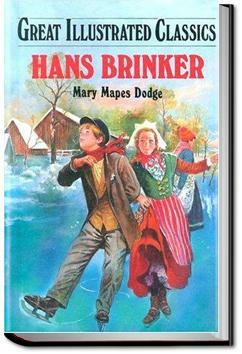 Come, Gretel, take this cent, and while Hans is trading for the skates you can buy a waffle in the market-place." "Let me stay home with you, mother," said Gretel, looking up with eyes that sparkled through their tears. "Hans will buy me the cake." "As you will, child, and Hans—wait a moment. Three turns of the needle will finish this toe, and then you may have as good a pair of hose as ever were knitted (owning the yarn is a grain too sharp,) to sell to the hosier on the Heireen Gracht. That will give us three quarter-guilders if you make good trade; and as it's right hungry weather, you may buy four waffles. We'll keep the Feast of Saint Nicholas after all." Luxuries unfit us for returning to hardships easily endured before. This is one of the greatest books for children I've ever met. Indeed you won't meet such books nowadays, not with such a beautiful language and such good lessons to teach. Super naivi, bet arī ziemīgi un labsirdīgi, kā jau decembrim pienākas. Un pat diezgan aizraujoši! What a delightful book this is. I am generally disappointed by children’s books, but Mary Mapes Dodge did not talk down to her audience, and as a result the read is enjoyable, even for an adult. This is an old-fashioned children's book, with a story meant to encourage the development of character and Christian values in its readers. I might be frustrated with its didactic tone if it were not for the fascinating background it gives on the Netherlands. Overall, it's rather charming. A wonderful tale of a close-knit family, set in the beauty of Holland. I come back to this nearly every winter! A perfect read to curl up in front of the fireplace with.